This is a wonderful SF novel. It's the first novel in a while to really engage me on the sense of wonder level, and to again awaken the feelings of awe and of "I want to be there" that were so central to my early reading of SF. I was complaining earlier about books like Jablokov's Deepdrive, and wondering if the fault lay in me. I mean: that book (Deepdrive) is full of neat ideas, original ideas, and I thought they were well handled, and the story was good. But I never felt fully engaged, never felt "awe". I still suppose the fault may be in my jaded self, but A Deepness in the Sky proves that its still possible to really knock me out SFnally. I'll briefly summarize the plot, hopefull avoiding spoilers. The book is set perhaps 8000 years in our future. Two starfaring human civilizations reach an anomalous astronomical object at the same time. One of the civilizations is the Qeng Ho, a loosely organized group of traders (reminiscent of Poul Anderson's Kith (this book is dedicated to Anderson) and of Robert A. Heinlein's Traders from Citizen of the Galaxy). The other is called the Emergent civilization (that name is one of many inspired coinages by Vinge). The astronomical object is something called the On/Off star, which shines for only 35 years then is a brown dwarf for the rest of its 250 year period. That's interesting enough, but what draws the two human groups is the presence of radio signals: an alien technological civilization has at last been discovered. The Emergents turn out to be very authoritarian, and they double-cross the Qeng Ho after having agreed to a cooperative exploration of the planet. However the Qeng Ho fight back, and the humans end up losing interstellar capability. One narrative thread thus follows the human characters as they wait for the On/Off star to ignite, and for the aliens to (with their help) develop a sufficient tech level to rebuild the starships. This thread also shows the Qeng Ho resistance to the Emergent rule. The other main narrative thread follows the Spiders, the arachnoid intelligent natives of the On/Off star's single planet. These beings have long adapted to their sun's peculiarity, by hibernating through the "Dark". But one culture, led by an endearing genius named Sherkaner Underhill, has begun to develop ways of living awake through the Dark time. But they are opposed by suspicious neighbors. And the human watchers begin to subtly interfere. The whole story culminates in a terrifically exciting finish, one which intrigues at the level of action-filled resolution of multiple plots, and also at the level of revelations of the solutions to a number of ingenious scientific puzzles, and thirdly at the level of satisfying emotional thematic resolutions to the journeys of a number of characters. It's uplifting without being unrealistic or mawkish. There are flaws, though to some extent the flaws are, I would say, necessary. This book is, I think, what Debra Doyle has called a "Romance", as such demanding larger than life characters and events. In this way, the main "flaws" are the somewhat pulpish nature of the plot and characters. But as I hint, I don't find these flaws serious. Indeed, they might really be necessary, indeed virtues, in the context of this sort of book. But it should be said that the plot depends on a few coincidences, and on things like the villains deciding not to kill the good guys because they're not sure the good guys are conspiring against them. (These villains are so bad, I don't see why they wouldn't just figure, "Better safe than sorry! ", and kill them anyway (or, in the context of the book, do something worse).) And the characters feature some extremes: most obviously the alien scientist who is just an awesome genius, and who appears at the perfect time in their society. The human characters also include some remarkable folk. And the villains are really really really bad. Gosh, they're bad. But that works, too, because their worst feature is original and scary and believable and a neat SF idea. 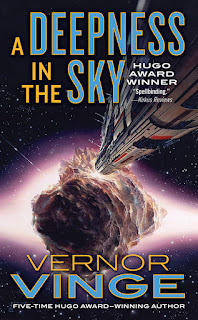 Good stuff: with Vinge, I suppose I always think ideas first. He has come up with several. First, his concept of an extended human future in space with strict light-speed limits (as far as anyone in this book knows), is very well-worked out and believable and impressive and fun. It depends on basically three pieces of extrapolation: ramships that can get to about .3c, lifespans extended to about 500 years, and near-perfect suspended animation or coldsleep. The second neat idea is the On/Off star. The idea of a star that shines for 35 or so years and turns off for 210 years is neat, and then giving it a planet and a believable set of aliens is great fun. The aliens are really great fun too: they are too human in how they are presented, but Vinge neatly finesses this issue, in at least a half-convincing way, and he shows us glimpses that suggest real alienness, too. (Include some very nice cultural touches.) The third especially neat idea I won't mention because it might be too much of a spoiler, but the key "tech" of the bad guys is really scary, and a neat SFnal idea. And handled very well, and subtly. As I said, I found the plot inspiring as well. This is a very long book, about 600 pages, but I was never bored. Moreover, as Patrick Nielsen Hayden has taken pains to point out, the prose in this book is quite effective. I believe Patrick used some such term as "full throated scientifictional roar". Without necessarily understanding exactly what he meant by that, the prose definitely works for me, and in ways which seem possibly particularly "scientifictional" in nature. One key factor here is names: names of characters, for one thing. Vinge's names of humans: Trixia Bonsol, Rixer Brughel, Tomas Nau, and so on, seem well chosen in several ways: they are recognizably human, and linked to present day languages, but just different enough to seem strange, and they (to my ears) sound good. His alien names are also fairly poetic, and both different and familiar sounding. (They are explicitly human coinages: a key point.) Thus: Sherkaner Underhill, Victory Smith, Hrunkner Unnerby. Mileage may vary, but I really liked these names. They certainly beat unpronounceable names, and names with non-alphabetic characters, and the like. The names of technological devices and future societies are also evocative. Examples from the humans include the Emergent society (a name with a double meaning), the Focus virus, and localizers; one alien example is videomancy. 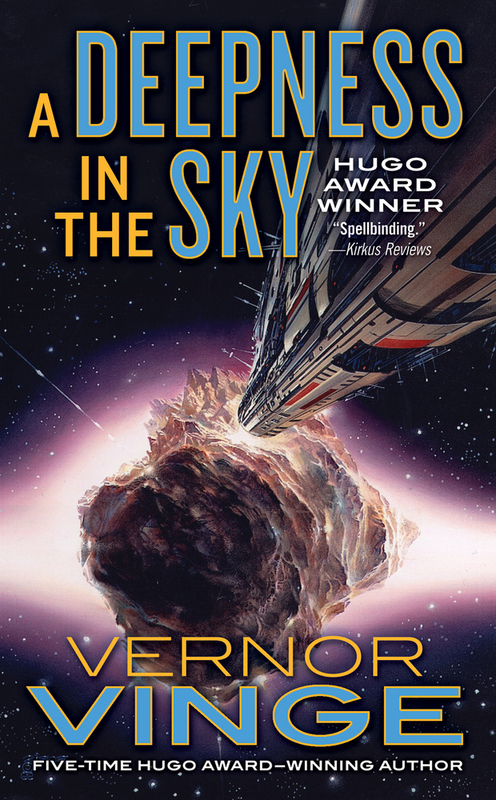 This book is a "prequel" to Vinge's excellent previous novel A Fire Upon the Deep, but it is readable entirely without knowledge of the other book. However, having read A Fire Upon the Deep does allow the reader of A Deepness in the Sky some additional pleasures (and ironies): in particular, speculation about the true nature of the On/Off star, and about the evolutionary history of the Spiders. Also, a main character of this book was also a significant character in the previous book, and knowledge of this character's fate adds a certain frisson to the events depicted in A Deepness in the Sky. In summary, this is an outstanding SF novel. It marries clever hard SF ideas, a rousing story, involving characters, and several interleaved, emotionally and intellectually compelling, themes. The themes are fine and fundamental to SF: involving the value of exploration and scientific knowledge, the value of freedom and thesacrifices of freedom, the desirability and costs of the dream of Empire, and the question "What would I give up to be smarter ... better ... more focussed?"